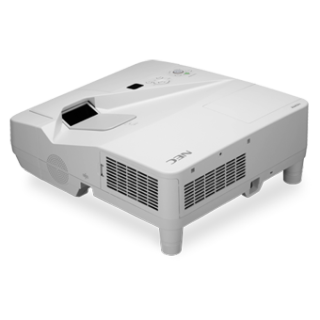 NEC Display Solutions of America has launched its UM Series of ultra short throw multimedia projectors. The 3300-lumen UM330X and UM330W include a variety of features while delivering a short throw distance for education and corporate applications. A complete interactive projector solution can be created using the optional NP02Wi eBeam interactive system, which connects between the USB port on the eBeam module at the front of the projector and computer, and uses IR to determine the wireless pen’s position within the displayed image. This technology gives users the ability to control their computers and annotate accurately at the whiteboard. With their ability to be mounted to the walls directly above the screens on which they project, the UM330X and UM330W help eliminate shadows and glare typically found with standard projection systems.